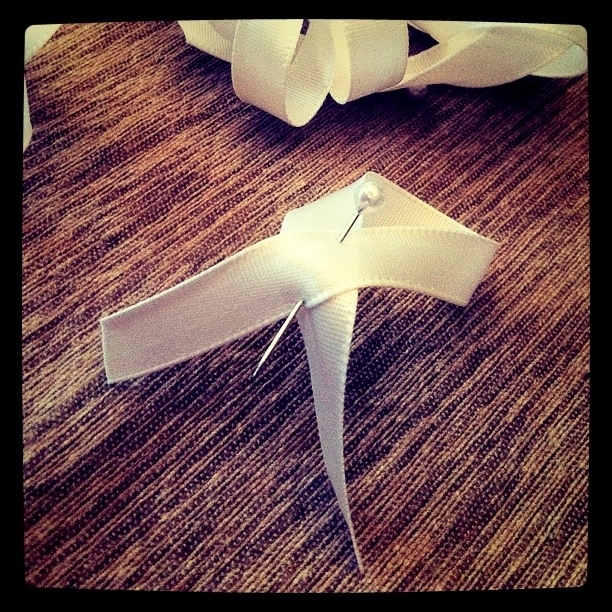 One of the white ribbons the puppets made to honor the White Ribbon Campaign on March 1st, 2012. This campaign was started by men interested in preventing violence against women, including domestic violence/intimate partner violence and sexual assault. At my university, we go beyond the male focus...and the puppets have embraced this. It’s the day after I have committed myself to applying for a Fulbright fellowship to Cyprus, and I am in the steep, warm ascent from deep-sleep to almost-awake sleep when I start to hear a slithery sliding sound. My eyes are still cloaked in warm red ember-colored glowing curtains (a.k.a. my inner eyelids) but I know that there is something that is traversing the space between reality outside of me and dreamland inside of me. I hear – sliding. I wish it would go away, as today will be a long day, and I have an important lecture to give. But soft wafts of silk seem to be caressing my face and after several tries, I am able to open my eyes to see what’s what I am met with beyaz kurdelelerinin (white ribbons) all over the place. This entry was posted in Visits from the Karagöz puppets and tagged École Polytechnique, Domestic violence, Karagöz and Hacivat, Violence against women, White ribbon, White Ribbon Campaign, women. Bookmark the permalink. 20 Responses to Beyaz kurdeleler: The puppets address violence against women in Turkey and the U.S. Domestic violence is a problem here (and child abuse) but I’m happy to say that this is being increasingly recognised by the authorities, spoken about publically and not swept under the carpet. My daughter did a course in Istanbul Uni on modern day society and economics.She also said that abuse against women in Turkey was rife. I was quite offended and wanted to know the statistics of various other countries who were perhaps the same or worse than Turkey. Why, lately is this subject highlighted about Turkey? I suppose i am going away from your point a bit, but i am very touchy about my beloved Turkey. You are right ,we must all stand united with loud voices and positive action to stop abuse/violence against women and in fact every defensless creature. Yes, I have noticed this trend over the last 8 years. Do you also think this has something to do with the (what most Turks I know consider a flawed and permanently failed) EU bid? Out from under the carpet we go. I think it is partly linked to the stalled negotiations and the requirement for Turkey to move towards European norms in social issues. But, I also think this is a result of pressure from the growing middle class. Jack…..Romania didnt have European norms in social issues, far from it but they were allowed to join the EU..The crux of the matter is reluctance to let a Muslim counrty in. Slowlybyslowly….funny you should say that because my friends also point out the violance and honour killings in Pakistan as if this is the only country that carries out such crimes. Obviously these things are terrible and we have to see change but lets also look on our own doorsteps to see the attrocities within. You have to spend time in these countries, get to know the people before condemning. Turkey is rapidly overtaking many EU countries in its health,education, environment issues and social services but unless you know the country you would believe the western press/media. Many people believe its a backward, uneducated country, can you believe! I have admiration for you and your courage to speak up and stand up for whats right. . . having been a dealer in extreme violence on behalf of the government in my past, I can tell you that in its many manifestations it fills a lot of my thoughts these days. Wherever we find men giving themselves ‘dominion’ over this or that we find violence. For as long as ANY form of violence is either lauded, accepted or ignored by society it will thrive and poison our global society. Thank you for your comment, Alan. And as always, I am honored and in awe of your brave step into the light to acknowledge what has shaped you. Glad you are in the boat! Wish the puppets could send you a white ribbon of honor! Rosamond – yes, of course, on Romania and on the fear of a Muslim-majority country. However, Jack is still right – those pressures are still there for the reasons he suggests, I think, even though there is an obvious double-standard. Glad also, but sad also, to hear that you get the same treatment re: Pakistan news 🙂 We can relate to one another on this. Thank you for your kind words – I have been out and loud about this issue for many years – as a survivor of violence myself – and so I forget that in some ways, writing this stuff is a courageous act. I just see it as a necessary reminder – especially for students who do not know. Off to give my lecture on the topic (U.S. context) now! Indeed. I am just struck by the rise of the Turkish middle class as we see the massive freefall of the U.S. middle class. Jack, although I consider myself an eyes wide open kinda gal, your comments on the U.S. always help me to open them even more, thank you! ….and I should add that I am a survivor of violence from a relationship OTHER than the loving one I am in now with M.!!!! honor killing still is going on almost all over Turkey. the violent towards women, indicated that honor killings had been reported many times, you can find this in UN reports easily. if any family problem shows up the authorities such as a women brutally beating by husband, the authorities don’t want to involve and they think this is a family matter. more over most of woman doesn’t want to go authorities or police station. in Turkey, you can go the police station but it is not easy to get out even if you didn’t do anything. Its true joker and i dont deny these facts. I was saying it is the same in many more countries, not only Turkey. thank you for respond, however i don’t know about the other countries, because i am Turkish i know only about Turkey. and Turkey is far from EU in many ways to me: human right issue, minorities rights etc. i am talking about normal individual rights as applied to members of racial, ethnic, class, religious, linguistic or sexual minorities. top of it, it is a Muslim country any way 🙂 no chance to get in EU, even GB and Italy are in Turkey’s side. I just saw a video http://www.youtube.com/watch?v=v2-e6_Bdzyc&feature=related, it is really scary this kind of sh… and in Europe there are many people like him. he just forget his toothbrush mustache at home i guess. however i agree with him about the law called: 301, we are pretty close to nazi Germany with this law.